The Implico Group has developed a software solution for handhelds that makes mineral oil loading faster, simpler and safer, enabling tank terminal operators to take the next step toward embracing the Internet of Things (IoT). The new, mobile solution connects employees in the field directly to the OpenTAS terminal management system to ensure that important information is immediately available everywhere. It also supports staff in the visual inspection of tank trucks and railcars. The digital transformation of business continues to progress – and downstream is no exception as demand is increasing for solutions that can replace the remaining paper-based processes. 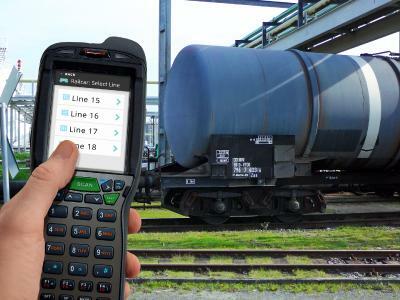 With its new software solution for handhelds, the Implico Group is now enabling digitalization in an area that was previously almost inaccessible: product loading in relation to railcars, ships and pipelines. Operations staff at refineries or tank terminals can digitally record incoming railcar and tank truck data using handheld devices and the new software, thus eliminating the need for subsequent entry of manual notes into the terminal management system. The solution is faster, more cost-efficient and avoids typical errors associated with manual data entry. The application uses a predefined checklist to guide employees step by step through the handling process. Since this checklist prevents staff from forgetting steps, it increases process safety. The checklist also supports the visual inspection of vehicles and loading, as prescribed by hazardous materials legislation for the transportation of dangerous goods. A history function in the application permits the entry of details such as earlier damage to a vehicle, enabling personnel to carry out targeted inspections of such areas. In many countries, vehicle compartments are sealed with special steel seals once loading is complete. Instead of painstakingly writing down complex seal ID numbers, employees need only a few seconds to scan in the numbers with the handheld application. This data is then stored immediately in the terminal management system. The new handheld application closes the previously existing digital gap between operations and the terminal management system. Refinery or tank terminal personnel can access the OpenTAS terminal management system during their work in the field,which results in substantial efficiency gains. For example, if the vehicle data is already stored in OpenTAS, it is shown to the employees as the default entry – so they do not need to enter the data again. Conversely, all data input by the operator is relayed back in real time, which means that the latest process information is visible immediately to the other team members. The system can also be used to confirm which operator performed which tasks, and when. The solution’s unique real-time transparency and the soon-to-be-available background checking feature can also be used to prevent product contamination: since the system is always fully up-to-date, it can report immediately if processes running in parallel may result in product contamination. The solution is compatible with any make of device, including those intended for use in explosion hazard areas. Backend functionality is provided by the OpenTAS Web Application Server. The handheld clients are connected in real time and access the solution via a browser. This enables true real-time transparency for logistics processes. The Implico Group optimizes logistics and business processes for oil and gas downstream companies. The international consulting and software company with its headquarters in Hamburg, Germany, has subsidiaries in Malaysia, Romania and the USA. Founded in 1983, the company today employs around 200 staff. 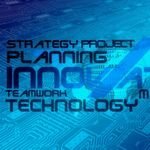 Implico provides consulting services, data services and software solutions for the entire supply chain - from forecasting, order entry, dispatching and tour optimization to data collation and invoicing. 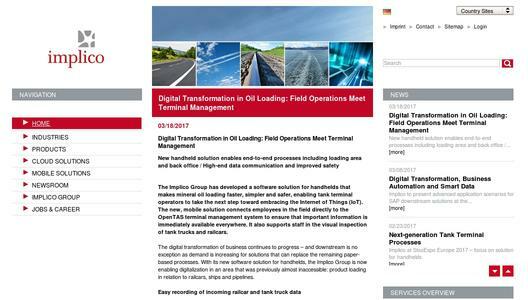 Leading oil and gas companies all over the world trust in Implico's industry expertise and high-performance IT solutions including OpenTAS®, SAP® SDM, SAP® RFNO and iGOS. OpenTAS automates the storage and transportation of hydrocarbons for refineries, tank farms, and service station networks. SAP SDM (Secondary Distribution Management) steers and optimizes the complete order-to-cash process. 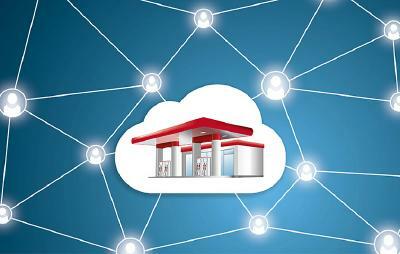 SAP RFNO (Retail Fuel Network Operations) automates all payment and quantity flows of service station networks. iGOS (Implico Global Operation Services) offers innovative downstream solutions out of the Cloud. 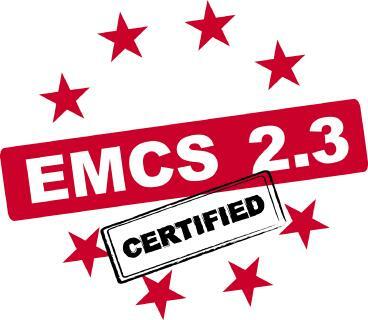 Implico is a Microsoft Gold Partner, a Software Development Partner of SAP and a member of the Oracle PartnerNetwork. The company has been recognized for its products and services on numerous occasions, e.g. for Supply Chain Management Software and as Oil & Gas Logistics Company of the Year 2015. In the field of Terminal Automation Systems, Implico is market leader in Europe, Middle East and Africa (ARC market study, July 2016).